I've been working on the wee house I shouldn't be working on. How can I help myself?!? If I have a grand idea that's itching to get out I have to act, least I forget. Specifically I've been working on one room in particular. 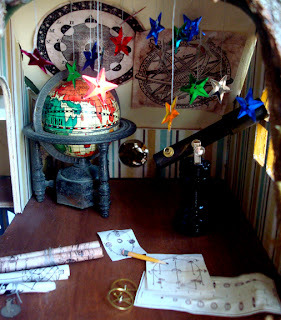 An observatory! It's not quite there but it's on the way and I'm really pleased so far. 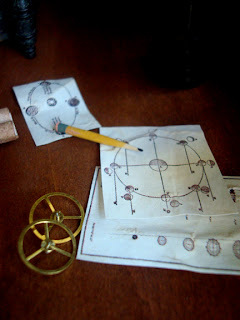 To give you an idea of scale... that pencil is the end of a toothpick and those fancy gears are from a wrist watch. there's just something so magical about a room with star charts and hanging stars, I'm right there with you on getting those ideas out before they disappear. Just brilliant! I love the tiny pencil - even knowing it's only 1/2 cm long it's hard not to see it as a real pencil! My retirement hobby is going to be making miniature rooms showing scenes from Sherlock Holmes stories. Of course I have dozens of other ongoing hobbies, and will no doubt have accumulate many more in the next twenty years, but I'm saving that one for official Old Age. This is the most awesome & amazing mini room yet! It's magical & wonderful! I thought and am still quite convinced that the pencil is a real pencil! :D The observatory is spectacular, I'd love to shrink down and putter around in there.